We are exporter of Wheat Flour from India. Owns and source good quality wheat flour and pack as per suitability of buyer. Can be packed in 50kg, 25kg, 10kg in all types of packing. The whole wheat flour or the chakki atta is a rich source of dietary fiber. Gluten is the wheat’s natural protein and it’s what gives baked goods their structure. When the dough is kneaded, these glutens develop and become elastic. 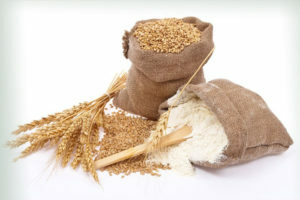 Flours made from hard, high-protein varieties of wheat are called strong flours. They have a higher gluten content. Flours made from softer, low-protein wheat are called weak flours and are lower in gluten. All-purpose flour is formulated to have a medium gluten content of around 12 percent or so. This makes it a good middle-of-the-road flour that can be used for a whole range of baking, from crusty bread to fine cakes and pastries. Even though all-purpose flour is a good general flour, most professional bakers don’t use all-purpose flour. Most professional bakers use either bread flour, cake flour, or pastry flour, depending on what they are baking. Bread flour is a strong flour, meaning that it has a relatively high gluten content—usually around 13 to 14 percent. A handful of bread flour will feel coarse and will look slightly off-white. Bread flour is used for making crusty bread and rolls, pizza doughs, and similar products. Cake flour is made from soft wheat and has a lower gluten content—around 7.5 to 9 percent. Its grains are visibly finer than bread flour, and it is much whiter in color. Its fine, soft texture makes it preferable for tender cakes and pastries. Best quality Wheat Flour from India is available in abundant also. Pastry flour is slightly stronger than cake flour, at around 9 to 10 percent gluten. It can be used for biscuits, muffins, cookies, pie doughs, and softer yeast doughs. It has a slightly more off-white color than cake flour. Self-rising flour is peculiar. It’s basically ordinary all-purpose flour that has baking powder and salt added to it. Intended as a convenience, it’s really anything but—the main problem is that there’s no way to control how much baking powder it contains. Also, when stored in your pantry, the baking powder in the flour will quickly lose its effectiveness as a rising agent. Unless you have no other options, this type of flour is probably best avoided. Whole wheat flour from india comes in two varieties: 100 percent whole wheat flour and white whole wheat flour. One hundred percent whole wheat flour is made from hulled red wheat grain. It provides more fiber and other nutrients than all-purpose flour. Generally speaking, it makes for heavier bread and baked goods and has a shorter shelf life than all-purpose flour. Whole wheat flour is often mixed with all-purpose flour for a lighter texture and better rising. While whole wheat flour is made from hulled white spring wheat. It has a milder taste and lighter color compared to 100 percent whole wheat flour. Have a look over more products we can supply.